Did Steven Moffat lose the script for Doctor Who's next episode? Okay, this is weird. Reports are circulating that Doctor Who's showrunner, Steven Moffat, has thrown the production of the show's Christmas special into chaos by losing the only copy of the script. Is this even possible? Filming for the DOCTOR WHO Christmas (10) special has been thrown into jeopardy after the top-secret script reportedly went missing... Executive producer and lead writer Steven Moffat is facing a race against time to create a new draft before filming commences next month. So again we have to ask... is this even possible? Does Steven Moffat write his scripts on an old manual typewriter or something? Does he not make backups at all? It seems a bit far-fetched. But then the blog Life, Doctor Who and Combom reveals that the latest issue of Doctor Who Magazine has a similar story. 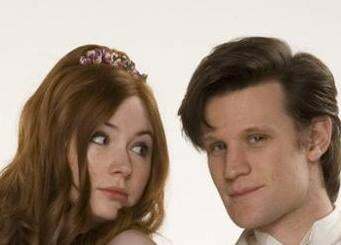 DWM's usual "production notes" column is taken over by Producer Piers Wenger and stars Matt Smith and Karen Gillan, because Moffat claimed the Christmas special's script had "disappeared." But as Life, Doctor Who and Combom points out, DWM is a glossy magazine with a long turnaround time, so these "production notes" were probably written a while ago. So it's entirely possible that Moffat has had time to rewrite (or reconstruct) the missing script in the intervening time. And he may very well have had earlier drafts laying around. Still, the mind boggles. It's enough to make you want to start a campaign to mail flash drives to the BBC or something. Oh, and on a totally unrelated note, the BBC's official Doctor Who site uploaded a new gallery of pics the other day. They're incredibly lovely and awesome, but also incredibly spoilery if you haven't seen the season finale yet. Do check them out.